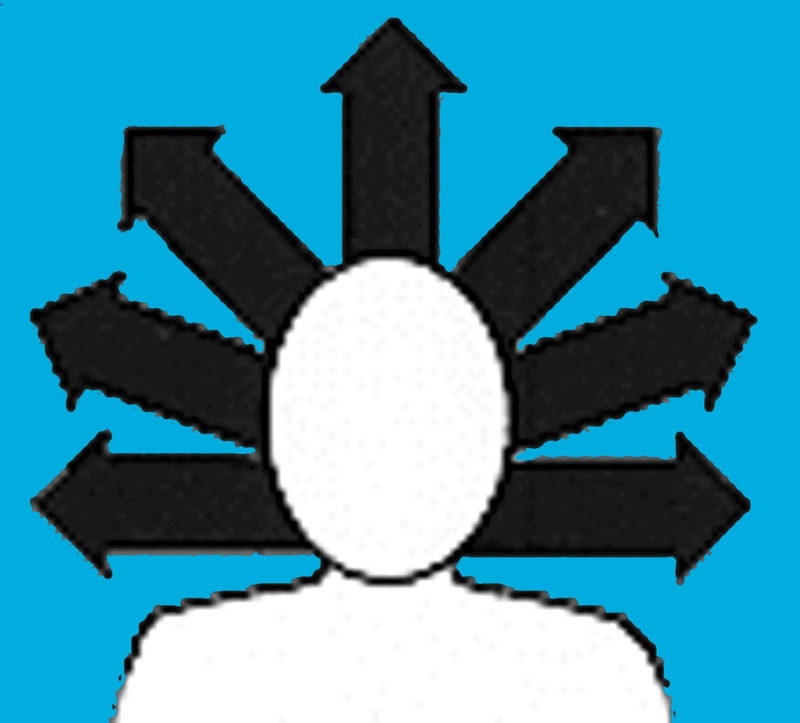 Welcome to your Multiple Intelligences SmartProfile™ Information & Management Center . Here you will find instructions on how to interpret and use the information from the "profile wheel" which you'll receive after completing the SmartSurvey™. Here are the instructions for using this special, members only site. 1. To get started, CLICK HERE for access to the SmartSurvey™ questions. Just follow the instructions on the start-up screen. 2. Make sure to PRINT YOUR PROFILE WHEEL. It will disappear when you close the program. 3. Follow the instructions below to help you analyze and interpret the results of the survey (Part 1) and to begin using your SmartProfile™ in your daily life (Part 2). 4. After completing the analysis of your own profile, if you're a mentor, coach, or trainer, make sure to check out the special Resources For Mentors, Coaches & Trainers included with each intelligence. These provide additional suggestions for using the SmartProfile™ and SmartStrategies™ with your "mentees" and participants. The Question is NOT "How Smart Am I?" It's rather, "HOW Am I Smart?" Now that you’ve been through the SmartSurvey™ and you have your unique SmartProfile™ (the pie chart), you’re probably asking “So what? What do I do with this information? This SmartProfile™ Information and Management Center provides an extended report on your unique profile including specific strategies to help you think, learn, and work smarter, all based on your profile. There’s really no point in knowing that certain of your intelligences are more developed and others need some help unless you know how to use this information to enhance the quality of your life. Let's start by getting a deeper understanding of your SmartProfile™. You'll notice right away on the profile wheel (or pie chart) that your responses to the different questions created a different "weight" to each of the Intelligences. Some are more developed. Some are emerging. Some are in various states of latency. However, the good news is that, since all 8 Kinds of Smart are already inside of you, you can develop all of them to much higher levels should you want to do this. Understanding Your More Developed Smarts! 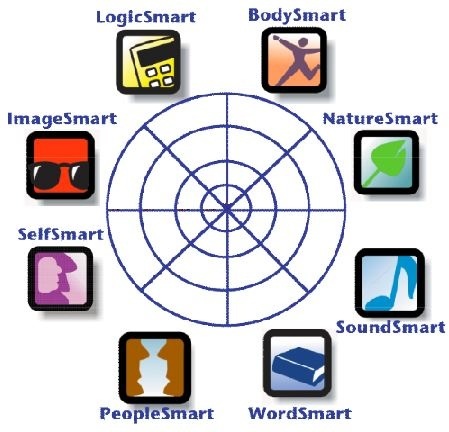 Look at your SmartProfile™ wheel and then, using the profile wheel image below, CLICK on the logos for your two highest scoring intelligences. You will be taken to an in-depth explanation of those intelligences. 1. First of all study the description of the intelligence on the 'intelligence home page" (that's where you'll land when you click the logos above!). 2. Second click on the "Core Capacities" of the intelligence. This will help you more fully understand the various aspects of a particular kind of smart. These are sometimes called "sub-intelligences". The capacities define the core operations of an intelligence; namely, the different dimensions of how it actually works. If you're wanting to improve one of your intelligences, work on developing those specific capacities which need some extra help. After studying your high-scoring smarts, it's time to look at the ones that scored low. CLICK on the logos on the wheel above for the two intelligences which scored the lowest on your profile. 1. First of all read the overview description on the "intelligence home page". 2. Click on the "Benefits" link on the left and learn more about how this intelligence can enhance your daily life. Here you'll also find a list of careers or professions which are often associated with the intelligence. 3. On the intelligence home page now click on the "Practices & Strategies" link. This will take you to a set of practices that are guaranteed to help you "grow the intelligence" in question. Think for a minute about anything you're good at in your life. How did you get to be good at it? Probably through regular practice. As the popular cliche says "Practice makes perfect". Each of the practices or strategies in this section are focused on helping you work on enhancing your under-developed intelligences. All it takes is doing the practice until you get your desired results! Following is a template you can use to begin experimenting with using your profile. Each section of the template contains a set of strategies which are keyed into different intelligence strengths. 1. When you want to LEARN SOME NEW INFORMATION , use your two strongest or highest scoring intelligences. Because you are familiar, comfortable, and skilled in these areas already, you’ll quickly and easily be able to get on top of the information. You’ll know what to do to gain a fairly thorough understanding of whatever it is you’re wanting to learn. Just go to the "Mentor's Resources" and select one or two strategies for each of your top intelligences then use these strategies to help you learn the information. 2. When you feel the need to BE CREATIVE or to “THINK OUTSIDE THE BOX ”, use the two intelligences which scored the lowest on your "profile wheel". If you approach a situation which requires you to think new thoughts, you've got to move beyond your tried and true more developed intelligences. Precisely because these intelligences scored low, you’re probably not as familiar with them so when you use them you don’t know what to expect. 3. When you have A PROBLEM TO SOLVE or A CHALLENGE TO MEET and your more developed intelligences (the one's with the higher scores!) are giving you the “same old, same old” answers, try a different approach. Use all eight intelligences to solve the problem. This may sound a bit outrageous, but it’s guaranteed to give you many new and unexpected solutions. 4. When you have SOMETHING YOU REALLY NEED TO REMEMBER , begin with [ first strongest ] and [ second strongest ] strategies but then choose at least two strategies from [ list the four “midrange” intelligences ]. You probably will only need two strategies but choose them from different intelligences. If you start with your most developed intelligence you’ll make sure you really understand whatever you’re wanting to remember, but add “remembering strategies” which are quite different and unusual from [ first strongest ] and [ second strongest ]. The more unusual the better. Remember, your brain thrives on novelty! 5. If you decide you want to STRENGTHEN something in your life that you perceive to be A WEAKNESS , first come through the doorways of your more developed or higher-score intelligences. Figure out how to work on the perceived weakness using your strengths. So, for example, let’s just say you’re not very good at listening to and remembering what was said in a speech or some other formal presentation. And let's say your two strongest intelligences are ImageSmart and SelfSmart. You might use your ImageSmart to create some visual images of what's being presented and your SelfSmart to reflect on the presentation as it's happening by writing down questions or personal implications of what you're hearing in the margin of your notes. These five suggestions for "Using Your Profile to Enhance Your Life" are by no means and exhaustive list of all possible situations where you can call you profile into play. But they do give you a way get started. Simply choose the specific situation which appeal to you most or maybe one where you feel using your profile would help you the most. "Plug in" The 8 Kinds of Smart and see what happens. I wish you Happy Intelligence Explorations! Contact Me if you have questions, feedback, suggestions, or if you need help understanding your profile. I'd love to provide you with a complimentary consultation.